On average, over Nu 7 M was spent on each political party for the primary round. In the general elections, close to Nu 260,000 was spent on the candidates. The report says there were no unspent funds returned by any party during the primary round. 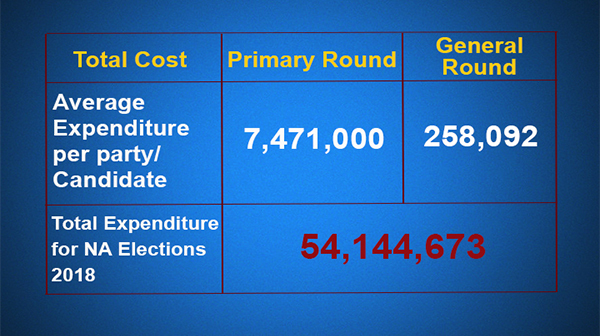 However, a total of Nu 124,407 unspent funds were returned by 55 candidates during the general elections. The parties and candidates spent most of the campaign funds in the hiring of vehicles, daily subsistence allowance (DSA) for candidates and their representatives and communications according to the report. The Royal Audit Authority (RAA) has also completed the audit of the election returns and submitted a report to the ECB last month. The commission, accordingly, followed up on its findings, observations and recommendations. The report highlighted inadmissible expenditures incurred by 28 candidates and non-deduction of Tax Deducted at Source (TDS) by Bhutan Kuen-Nyam Party (BKP) and Druk Phuensum Tshogpa (DPT). Both the issues have been resolved. And for the late submission of election returns by the DPT’s candidate from Lamgong_Wangchang constituency in Paro, the ECB has disqualified the candidate from contesting any future election.